When planning for your next ski vacation, consider taking a trip to the Pocono ski areas. There are numerous resorts to check out as well as a variety of skiable areas that are perfect for skiers of all skill levels. These locations are great for families, couples, and single travelers to visit. 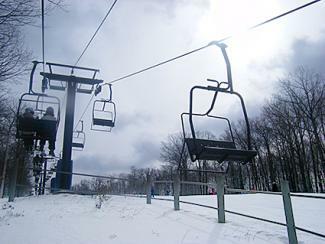 Each ski area in the Poconos is unique and offers many activities and amenities. If you will be visiting the Pocono Mountains for a vacation, consider skiing at more than one area. Ski season generally runs from December to March. On average, the Pocono Mountains receive 50 inches of snow annually. Alpine Mountain Ski and Snow Tubing Center has something for the entire family to enjoy. Located in North Analomink, Pennsylvania, this center consists of 21 trails that range in difficulty. This area is perfect for families and those just learning to ski since it is smaller and offers something for everyone. Alpine Mountain is unique in that the area offers packages for events such as birthday parties and other such family friendly get-togethers. Blue Mountain, located in Palmerton, Pennsylvania, has the highest vertical drop (1,082 feet) in the entire state. There are 37 trails on 162 acres of skiable terrain as well as a snow tubing park with 21 lanes. The area is serviced by 12 ski lifts including the area's only detachable six-pack lift. Blue Mountain offers packages such as a first time ski and board package that includes lift tickets and lessons. 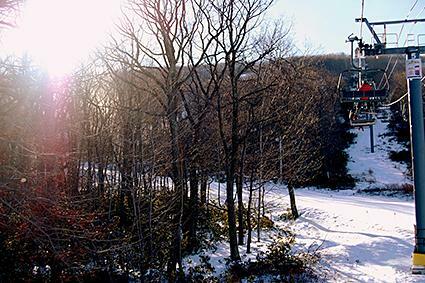 Camelback Mountain Resort is located in Tannersville, Pennsylvania. Camelback is the largest resort in the Poconos. It has a summit elevation of 2,050 feet and a vertical drop of 800 feet. There are 156 skiable acres consisting of 34 lighted trails serviced by 15 ski lifts. Near Camelback, you can find many options for ski packages including home rentals, hotel reservations, resorts, cottages, smaller inns and motels. Jack Frost Big Boulder Ski Area offers two ski areas at one resort at its Blakeslee, Pennsylvania location. With 24 trails as well as snowboarding parks, both Jack Frost and Big Boulder ski areas have something to offer skiers of all skill levels. Jack Frost is designed more for traditional family skiers while Big Boulder is geared more towards snowboarding and terrain park skiing. Deals and packages are available for military families, college students, families, and more. 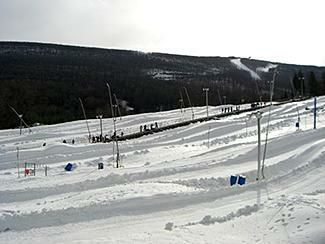 Ski Big Bear at Masthope Mountain is located in Lackawaxen, Pennsylvania. It has a vertical drop of 650 feet and has 18 trails serviced by six lifts, two of which are magic carpets. There are also cross country skiing trails, a snowboarding terrain park and snow tubing. Ski packages oriented towards weekend skiing or families with children are available from different resorts at Big Bear including Woodloch and East Shore. Located in Northeastern Pennsylvania, the Pocono Mountains are a popular destination for romantic weekend getaways, honeymoons and winter vacations. The mountains are home to some of the best skiing in the Eastern US, due to the wide range of options that appeal to skiers of all ages and abilities. In addition to skiing, many of the areas offer snow tubing, snowmobiling and a range of other winter activities such as ice fishing. The Pocono Mountains are close to New York and New Jersey making them the perfect East Coast destination. Each ski area in the Pocono Mountains is family friendly. They all offer a variety of trails from beginner to expert. Some resorts offer childcare, lessons and equipment rentals. Many feature a range of other activities such as ice skating, dining and much more. If you are looking for a getaway that the entire family can enjoy, the Poconos is a sure bet for an enjoyable time!